Medium (Size 10) - $16.99 Only 2 left! Let’s face it, those Disney princess have a great team of stylists. Their magical hair that always falls into place just so, their always flawless makeup, their perfectly tailored dresses and capes that never seem like they would be difficult to—oh, we don’t know—climb a mountain or save the fate of Arendelle in. If only life were so easy! You’re a princess of a different ilk, and a toned-down approach always works best for your busy lifestyle. 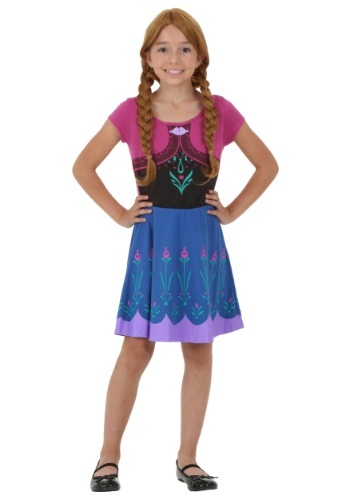 This Frozen Tween I am Anna Costume holds all the magic of your favorite film, but without the petticoats. Whew! Since Frozen is really all about embracing who you really are, you can rest easy knowing this costume allows you to “let it go” and be yourself: a sporty and casual princess. A low key princess. A “less is more” princess. Just like Anna, though, you’re determined to see the task through, so you’ll make sure to have all of your lines memorized in case an Olaf or Elsa show up to class. Just think of all the scenes you can act out from the film! The best thing about this costume is its true simplicity; printed with all the pink, blue, and black details of Anna’s film ensemble, this cotton-spandex A-line dress can travel easily with you through your whole busy day, from home to school to play practice to a study session. Just place your hair into two Anna-esque braids and warm up your singing voice, as you’re bound to do a few renditions of the film’s famed songs throughout the day. For the first time in forever, a costume perfectly suited for you!